The classic cowardly betrayer is the New Testament figure of Judas Iscariot. Hiding among the disciples, he betrays his leader for 30 pieces of silver. 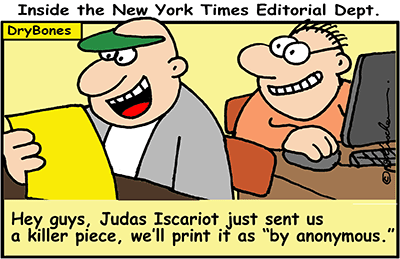 I'm amazed that the NY Times actually printed an "anonymous" Op-Ed. How do we know that it wasn't actually written by a NY Times writer? "They wouldn't" you say? I figure that this anonymous event is the last nail in the coffin of their reputation. We want to continue to fight the good fight but we can't do it alone. The LSW (Long Suffering Wife) and I need your help.